By the way, in case you’ve been wondering “What’s with the cat?” — She’s to help with the pronunciation of my name [mou-zer]. Cats, of course, have historically been known as excellent mousers. And, yes, I love cats and have had a couple of my own bring an unfortunate “trophy mouse” and drop it at my feet to show their prowess. Currently, though, my little animal companion is Jambalaya the Maltipoo. 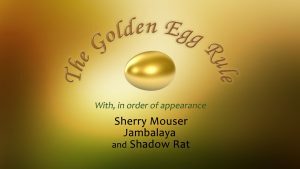 Just for fun, check out my video: The Golden Egg Rule featuring Jambalaya and my puppet friend Shadow Rat helping me demonstrate how sometimes procrastination is actually incubation.